Where does the idea of a place like Dynamo come from? Bicycles are widespread in Bologna because here biking is easier and faster than driving, due to the size of the city. Bicycles often get stolen and for this reason, there is a growing demand for safer spaces where to park them. 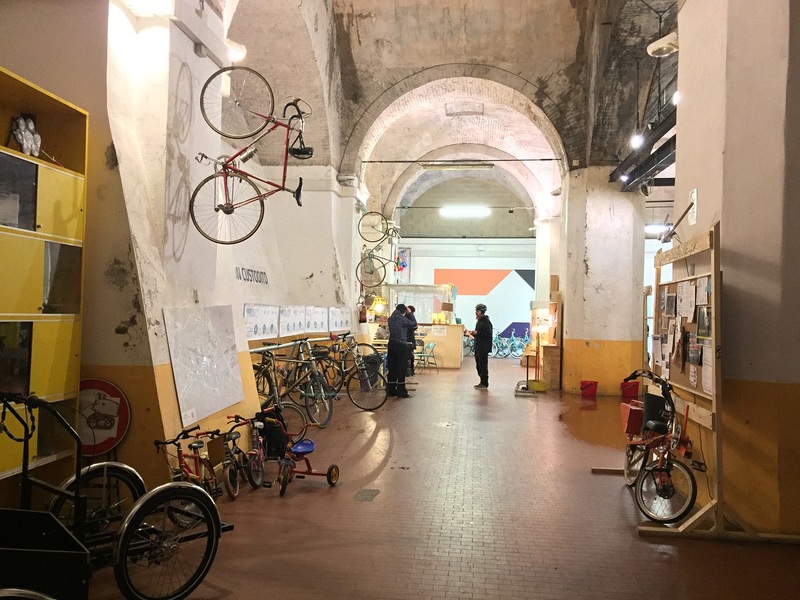 In our region, Emilia-Romagna, smaller cities and towns often provide some kind of bicycle parking: many train stations have open-air bicycle racks, some others have covered bicycle racks and some places provide bicycle parking areas accessible with badges. While a limited-access area is safer, accessing the area and stealing bicycles is still possible. For example, the bicycle parking of the city of Brescia, in Lombardy, experiences up to 30 thefts a year. Our model works differently. As we figured that Italians are car-oriented people, we implemented for our bicycle packing a system similar to the car parking one: users come here, leave the bicycle to our staff and go. Our staff is the only with access to the parking area and this makes bicycles theft impossible. Since our opening, we have parked over 60,000 bicycles and none of them has ever got stolen. Our parking is located inside a tunnel where we park any type of bicycles, from the most common ones to cargo bikes, tandems and electric ones. We also rent out bikes to people, mainly to tourists. What do the average users look like? When we launched this project, we imagined it as the perfect place for the more expert, hip and demanding bikers. We soon realized that our main target is actually the ordinary, unprepared cyclist. We became a home for those urban cyclists who need information and assistance on all types of issues, from bicycle paths around the city to repairs and even legal procedures in case of accidents or need for anti-theft trackers. If we would have to define our main users with a term, we would call them “entry level” urban cyclist, to whom we end up also offering moral support. Our activity has also created a new target group because many people started using the bike to commute. Those who were already used to commute to the train station by bike are not our most frequent users since they are already accustomed to this practice and they rarely need our services. How much does it cost to park a bike here? a service that would be easy, fast and useful and which goes beyond an environment-friendly and idealistic rhetoric of preferring the bicycle to the car. Our association focuses on the use of bicycle and our social mission is to teach urban cyclists the value of accessories, how to use them and how to get the best out of their bicycle. Our services are fee-paying, but they are all useful. Besides the bike parking, we also have a shop where we sell bike accessories and new bicycles. Due to the high theft rate, Bologna’s market is full of low-value bicycles. People tend to avoid investing much in a bicycle because they know it is likely to get stolen. We are trying to make people love their bikes and facilitate their use as it happens in the Netherlands and in the UK. Although we are aware we could sell many more bicycles at an average price of €50-100, we don’t sell low-quality or second-hand bikes. We want to offer people something reliable, and since we are all passionate about cycling, we choose bikes and accessories we would use ourselves. For example, we sell locks that cost over €40 because we realize that cheaper models are easy to break. We also created a guide specifically dedicated to locking the bike, and another guide is about maintenance. There are many things you can keep an eye on and fix by yourself even if you are not a grease monkey: if you find a split on your tire, you should be able to recognize that it may lead to a blowout and you could be left in the middle of the street, maybe 10 kilometers away from work! We want to make life easier for our users, which is why we also repair bikes. If you need us to repair your bike, you can bring it here and we will estimate the damage and give you a quote. We register the bike with a code and you’ll receive an SMS to pick it up, once it is ready. We also lend bikes, free of charge, if someone needs a bike while the personal one is being repaired. We offer many other services: there is a sitting area with wifi and a restroom, open to anyone –a free of charged toilet close to the train station can be a useful service –and our luggage depot is always open, unlike the one in the train station, and it’s even cheaper. With these services, we hope to attract more people and to make them consider using a bike. The community is an important value to us, so every year from April until October we organize events, courses, concerts and parties in order to foster social interaction and produce culture. The events area has a bar and a big courtyard where we host markets – for example, every Sunday there’s an antique market. We seek cooperation with other commercial activities by renting out an exhibition area and we also host Leila, an association that collects and shares various kinds of useful tools people can borrow, such as drills. Is this area a municipal property? How are you organized? 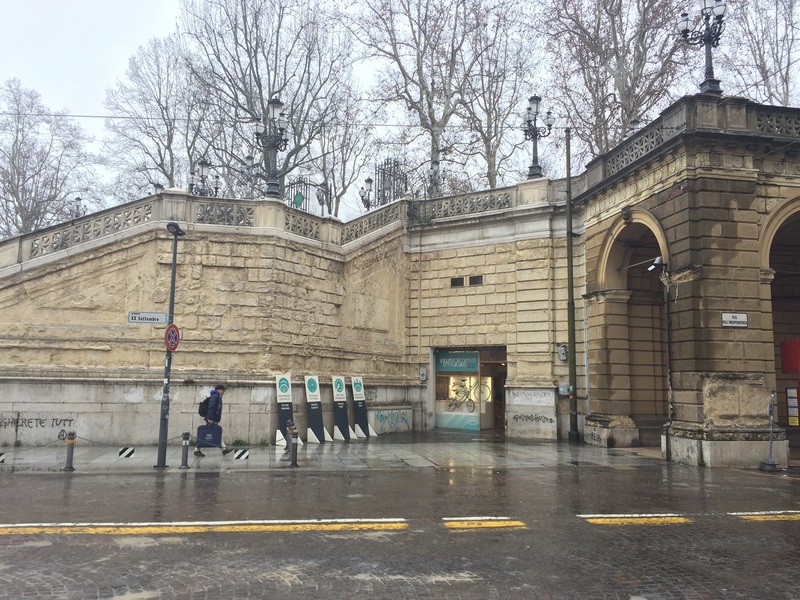 Yes, this is municipal property, and we are located underneath the Pincio monumental staircase, in the area commonly called Parco della Montagnola. This is the biggest green area in the city center and it used to host the papal residence. In the 17th century, the citizenry opposing the Church tore it down. For a long time, this space didn’t have a precise function, it only served as an under-stair. In 1960, it became a parking lot where car owners used to leave their car at the entrance, and the staff would park it inside and this is why for over 50 years nobody ever walked in, it was a forgotten area. Given its beauty, its historical value and its very central location, the Municipality included it among the venues for the Incredibol programme. 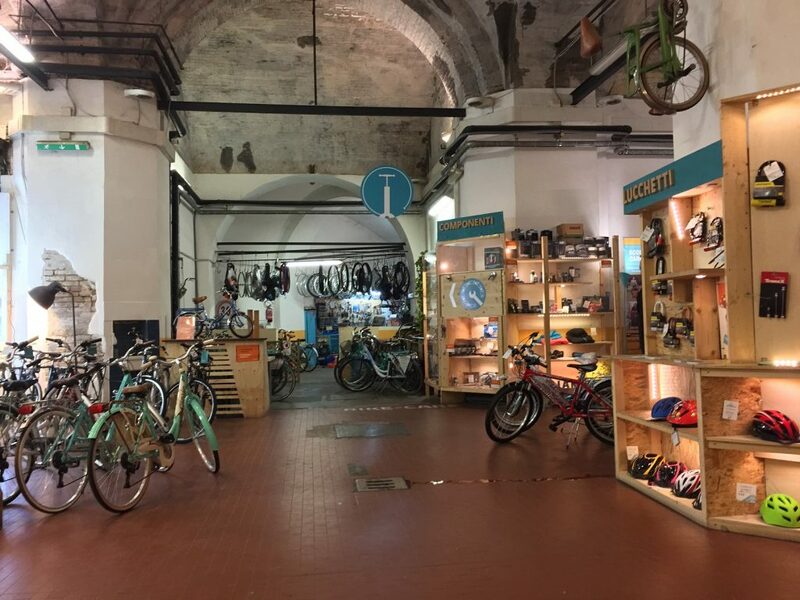 Incredibol is a grant managed by the Municipality of Bologna that allows innovative startups to use and regenerate a space for a certain period, free of charge. This initiative exists since 2013, and every year the Municipality chooses about 20 projects and assigns them the most appropriate venue, usually for four years. When we proposed our project we didn’t even know this space existed and, in fact, we were looking for privately owned venues, but we still gave the Incredibol grant a try, and we applied. We were speechless when they told us about this space! Both the square footage and its location are fundamental aspects for the success of our project, so this was our best possible choice. We moved here in June 2015 and spent the first three months cleaning it up and restoring it since over the past 60 years nobody has ever done any maintenance. We announced a “call for arms” and involved our community in the cleaning, painting, fixing and building. That summer over 100 people helped us. We then decided to open a coop, thus separating this start-up from our cyclists’ association. In the beginning, we were a group of six associates, and our first investments originated from membership fees, so we didn’t have a lot of money available and we had to do everything step by step. We tried to involved in the start-up all those members of the association who were interested. We opened in September 2015, but at that point, we had done a third of the improvements you can see now, but given the fact that we are granted this space for only four years we wanted to start as soon as possible. We started with the parking, the rentals, the repairs corner, and the events area. As more and more associates joined, our capacity grew as well and we could offer more services. Now, we also have a bicycle courier service and we recently started to organize guided tours around the city. By the beginning of 2018, we have become a group of 11 partners and 4 full-time employees, and during the summer we have an additional 4 to 5 people working in the events area, in total we are a group of about 20 people. The most beautiful thing about this job is being able to make a living out of our passion: some of us used to work in call centers, others used to work in fast-food chains. We managed to create job opportunities for ourselves and for others, fighting the state of precariousness that characterizes our generation and we hope this can serve as an added value to our city. The Incredibol grant lasts for four years. Is it renewable? This is not a typical project. We offer a public service, but we are privately run. Our parking fee is definitely underpriced, but this is the only way we can attract people. Our additional services and activities allow us to make up for the parking economic loss, but it’s still hard. We monitor our production, our workload, our waste and we try to enhance the most lucrative activities. Recently the Municipality of Bologna saw the potential and the usefulness of our project and allocated €1,5 million from the PON Metro program for a venue upgrade. We weren’t able to do all we wanted by ourselves, for example, there is no heating and humidity is a big problem. This new renovation phase will begin in October 2018 and will last for a year. Our four-year term will be extended because of this maintenance but we will try to keep the parking area open, as it became a fundamental service for many people. We don’t exactly know what will happen at the end of the grant period. We will probably cease to exist as a start-up and will become a proper business/public service provider. Of course, we will propose ourselves again as managers of the place and hopefully, we will be able to keep it. Should we eventually lose this place, we will go elsewhere, we will do something else because we have tons of new ideas and we have become known for what we have done here. Interview with Simona Larghetti on 22 February 2018. Bologna, Community, Culture, education, Environment, mobility , community, economy, mobility, temporary use.